Keith Haring (Reading, May 4, 1958 – New York, February 16, 1990) was an American painter and writer. He was one of the most singular exponents of frontier graffiti, emerging from the New York art scene during the boom of the art market of the nineteen years along with artists such as Jean-Michel Basquiat and Richard Hambleton: his works represented New Street culture. York of that decade. First and only male of the four sons of Allen and Joan, shows an early fondness for the design encouraged by his father, cartoonist and cartoons. It was the characters of comics like those of Walt Disney, Dr. Seuss and other heroes of television animations to exercise a lasting influence on him. It is precisely in this period that he decided to make stylized art his reason for living. At the end of high school, he enrolled at the Ivy School of Professional Art in Pittsburgh and later at the commercial-art school. Soon he understands that this is not his way and he leaves school. In 1976 he began touring the whole country hitchhiking, knowing many artists. He went to San Francisco, where with his frequentation of Castro Street he began to express his homosexual orientation. Return to Pittsburgh and enroll at the University; to keep himself working as a waiter at the cafeteria of a local factory. Later he finds a job at a place that exhibits art objects. Here he makes his first personal exhibition of drawings. He was also arrested several times for “smearing” the walls. Important for its future evolution is a retrospective dedicated to Pierre Alechinsky, organized in 1977 by the Museum of Art in Pittsburgh. In 1978 he exhibited his new creations at the Pittsburgh Center for the Arts, then went to New York and entered the School of Visual Art. His personal interest brought him closer to the works of Jean Dubuffet, Stuart Davis, Jackson Pollock, Paul Klee and Mark. Tobey. This is the period in which his popularity explodes: he begins to make graffiti especially in subway stations and his pop-art is greatly appreciated by young people, so that his works will often be stolen from their original location and sold to museums. For his (illegal) “graffitaro” activity he is arrested several times. In 1980 he participates together with Andy Warhol at the Terrae Motus art festival in favor of children affected by Irpinia. It also occupies a building in Times Square creating the Times Square Show. He then established many other exhibitions until the Tony Shafrazi Gallery became his personal gallery. In 1981 he took part in the first exhibition organized at the Nosei gallery, Public Address, along with works by Jean-Michel Basquiat, Barbara Kruger and Jenny Holzer. In 1983 he exhibited in Sao Paulo, Brazil, London and Tokyo. In 1984 he went to Bologna, invited by Francesca Alinovi, to exhibit in the Art of Frontier exhibition. In 1985, in Milan, he painted a wall in the Fiorucci shop. Elio Fiorucci, in an interview with the monthly Stilearte, recounts that experience: «I invited Haring to Milan, bewitched by his ability to elevate extemporaneousness to the highest levels of art. He gave birth to a no-stop happening, working for a day and a night. His signs “invaded” everything, the walls but also the furniture in the store, which we had emptied almost completely. It was an unforgettable event. I brought a table, flasks of wine, glasses. People came in to see Keith paint, stopped to drink and chat. Twenty-four hours of continuous flow; and then the newspapers, the televisions … Later, the murals were torn and sold at auction by the Parisian Binoche gallery. ” In 1986 he opened his first Pop Shop in New York, where you can buy gadgets with his works and see the artist for free at work. The same year he painted children holding hands on the Berlin Wall. Later he goes to the ghetto of Harlem where he paints the words «Crack is Wack» («crack is a crap» on a large wall on East Harlem Drive). He often collaborates with Angel Ortiz. In 1987 he decorated a part of the Hospital Necker in Paris. In 1988 he opened a Pop Shop in Tokyo. On that occasion the artist states: “In my life I did a lot of things, I earned a lot of money and I had a lot of fun. But I also lived in New York during the height of sexual promiscuity. If I do not take AIDS, no one will take it. “In the following months, he declared, in an interview with Rolling Stone, that he was suffering from the HIV virus. 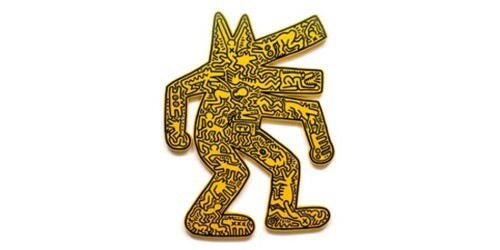 Soon after, the Keith Haring Foundation, which still aims to continue its work of support to organizations for children and the fight against AIDS. In 1989, near the church of Sant’Antonio, abbot of Pisa, he performed his last public work, a large mural entitled Tuttomondo and dedicated to universal peace.